I recently sat down with Riccardo to learn more about how he came to the field of art history, how the fellowship helped further his research, and his experience teaching an art history course at the Center. Riccardo grew up in Rome. With art, history, and culture at his fingertips he was educated in the classics with an emphasis on philosophy and aesthetics. 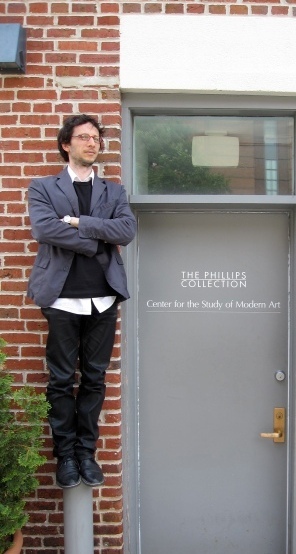 During his graduate work he translated several of Mark Rothko’s writings into Italian – such as Writings on Art (Donzelli, March 2006) and The Artist’s Reality; Philosophies on Art (Skira, October 2007). He also authored Mark Rothko: Space and its Discipline (Electa, Milan 2007), the first monograph on the artist to appear in Italian. Through research, teaching, translating, and writing on Rothko, Riccardo has become a veritable scholar on the artist. During his residency at the Phillips, in addition to spending serious time in the Rothko Room, he continued his investigation on how writings on early cinema can be crucial to a reconsideration of modernist painting. Riccardo taught a class on Rothko and the cinematographic experience for graduate students from The George Washington University and members of the public. The students benefited from collection visits and in-gallery class time, something rare in the university setting. Students were able to spend time with the works they were studying, providing a very personal experience of the art. Riccardo’s spring 2011 fellowship comes to a close at the end of this month when he will return to his home in Paris. We wish him well. I won’t say goodbye, only: until we meet again. This entry was posted in From the Center and tagged Mark Rothko, postdoctoral fellows, Riccardo Venturi, The George Washington University. Bookmark the permalink.